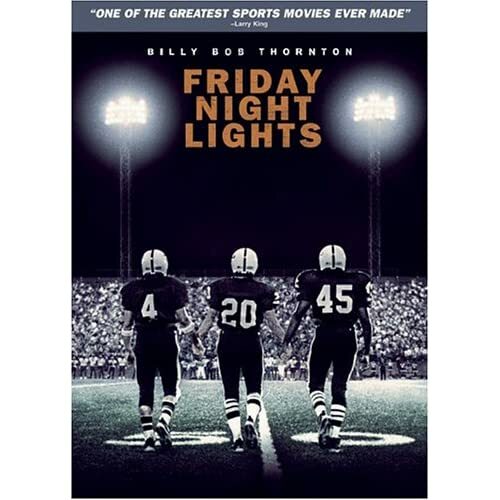 It comes down to this: If you consider Bull Durham a romantic comedy, then Friday Night Lights is the greatest sports movie ever. The barren, washed-out landscape of west Texas in 1988 provides the canvas for wrenching emotional manipulation in this true story. Based on H.G. Bissinger’s book chronicling a drama-filled football season of the Permian Panthers, the most successful high school team in football-crazed Texas, FNL introduces you to a few key players and their town’s suffocating, win-at-all-costs culture. Something tells me you didn’t have any media frenzies at practices for your high school football teams. Not so here, where we meet somber quarterback Mike Winchell (Lucas Black), who cares for his ailing mother and never appears to be enjoying himself on the field; running back Don Billingsley (Garrett Hedlund), whose abusive, alcoholic father was a Permian legend in his time, and Boobie Miles (Derek Luke), an ebullient, explosive tailback with dreams of a state championship leading to a full ride at USC. FNL almost sneaks up on you in the way it’s able to skillfully develop all these storylines, plus that of new coach Gary Gaines (Billy Bob Thornton), who, though passionate, treats the town’s obsession with football with a detached bemusement. And it excels at its depiction of the characters’ struggles with holding onto any measure of joy amidst the depressing situations around them. Billingsley’s father (Tim McGraw) takes the anger stemming from his dead-end life out on his son. Winchell, unlike everyone else, isn’t sure he actually wants to get out of town, out of respect for his sick mother. And Boobie doesn’t mind having the expectations of the entire state on his shoulders, until he suddenly can’t meet them anymore. What happens when you can no longer do the only thing you’ve ever considered doing? At times visceral–anger and expectations and pain and bone-crunching hits piling up on you–but often reflective, FNL lets it storylines unfold as the Panthers’ season reaches its breaking point. And, in doing so, it breaks from so many of the conventions of sports movies. It doesn’t waste time with predictable arguments between the coach and his wife over the time spent on his job, or manufacture petty conflicts between teammates. There’s a moment when it appears that the chronic fumbler will redeem himself and save the day with a gritty run…except life doesn’t quite work like that. Coach Gaines tells his quarterback that, “There are no curses in this life,” but not everything works out in the end in this life, either. At halftime of the biggest game of the year, Gaines simply reminds his team, “You’ve got two more quarters, and then most of you will never play this game again as long as you live.” His line during his speech to “Put each other in your hearts forever, because forever’s about to happen out here in a few minutes” in one of my all-time favorites. As any great movie-sports or otherwise- should do, FNL makes its critical events show just who the characters really are. The wins and losses really only matter insofar as they reveal character, and at the climax, as another brilliant piece of the soundtrack mourns with us, Billingsley’s father walks out onto the field, for a second time, to intercept his dejected son. And as he completes his arc and stamps the film as an all-timer, he provides one of the strongest, most resonant moments I’ve ever seen in any type of film. There’s only one scene you’ll first mention after seeing this. I mean, this movie is just so much better than. say, Hoosiers, that I can’t even fathom it. Rather than trying to uplift you based on the talents of the players on its screen, FNL does so based on the exceptional direction, the uniformly excellent acting, and the feelings generated by moments like Winchell’s first genuine smile and that shocking, poignant postscript. A win for the Panthers is a relief, not a triumph, but Friday Night Lights is the latter. This is a fantastically-written review. I had never heard of this movie, but now I know what I’ll putting next in the Blockbuster queue! Thanks Kristin, I really appreciate it. Just saw this movie for the first time. I agree it’s excellent. I thought McGraw’s character was a bit over the top, only barely redeemed by his softer moments. But the soul-sucking nature of the football pressure is portrayed convincingly. The movie just brilliantly defies all of the cliches about sports filmmaking. Fantastic.